This year we have split the men into 2 separate prejudging DVDs as there are so many outstanding physiques. 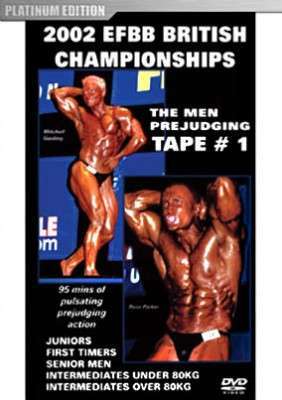 In addition, the Prejudging is the only time you will see all the competitors pose. Only the winners get to pose at the evening show. You will see the following classes in this DVD #1: Juniors, First Timers, Senior Men, Intermediate Men Under 80 Kg, Intermediate Men Over 80 Kg. This year we have split the men into 2 separate prejudging DVDs as there are so many outstanding physiques. In addition, the Prejudging is the only time you will see all the competitors pose.Only the winners get to pose at the evening show. See our FULL CONTEST REPORT BELOW. Brian Connelly, who won the Senior Men, (left hand end of Senior Men lineup, above) was so outstanding he was later booked to guest pose at the English Pro Grand Prix held a month later.